The Corruption of Pelursk is a system-agnostic tabletop RPG dungeon, written by Shel Kahn. 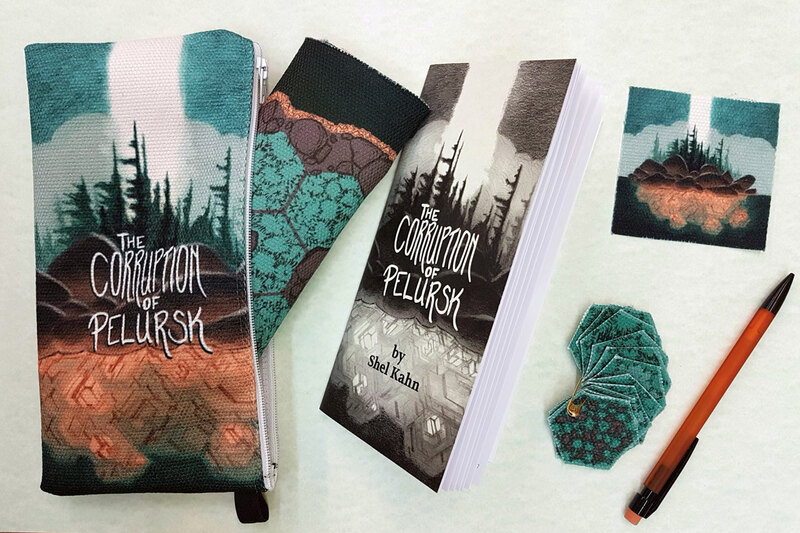 The Isle of Pelursk holds a glowing, steaming, mist-shrouded secret at its heart, and once you’ve entered its clutches it does not want to let you leave. Designed to fit easily as a sidequest into an ongoing campaign or stand confidently on its own, The Corruption of Pelursk launched on May 15th 2018 as a Pocket Dungeon Pack! all tucked into a 9 x 4″ canvas zippered pouch. 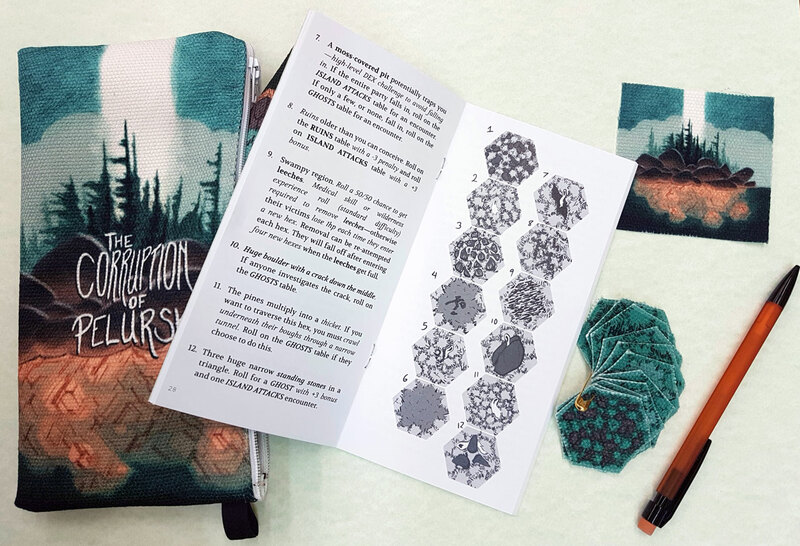 Also available are the zines themselves, packaged with a black and white map and ready-to-cut hexes at a slightly smaller scale. Check out the pocket dungeons and pocket dungeon packs available in the store right here. 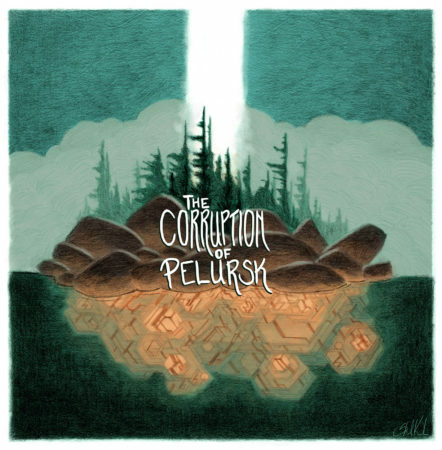 Thanks so much to Jason and Tom over for their thorough review of The Corruption of Pelursk on their podcast Fear of a Black Dragon, at The Gauntlet! I like that the spine of the adventure is simple enough to grasp and to remember, after a single read I feel like I could easily run it. The fabric elements add a nice tactile feel that fit with the setting where everything is handcrafted by people. 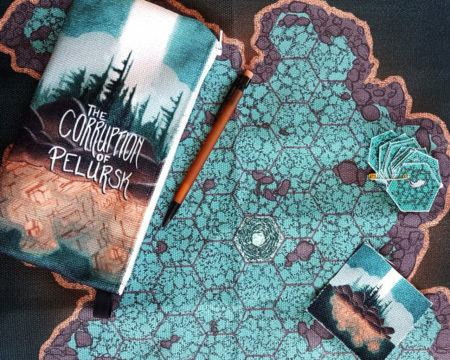 Having presumably tricked their way onto the island the game then shifts to a clever hex-crawler with the island interior being the hex map and then you roll and place cutout hexes onto the map. … The hex crawl is definitely the more interesting part of the scenario and is quite imaginative.